Former Westbourne Methodist Church, Poole Road. The Methodist Church in Westbourne was formally constituted from 1887. The church building on the corner of Poole Road and Landseer Road was opened in 1899. Like the also now closed Congregational Church, there appears to be little published about the Westbourne Methodist Church. It was a Wesleyan Chapel, and was fairly active in its heyday, with mid-week services and youth work. It succumbed to closure in the early 2000s, and in November 2009 was sold. The main church body became a Tesco Express. A floor was put in the main part of the former nave to create a restaurant area – Originally “The Rock”, and latterly “Plates Restaurant”. The former hall became a children’s play facility, and the former Manse is now the home of NFU Mutual. I am indebted to Alwyn Ladell for the use of some of the photographs from his Flick account for this blog. Alwyn Ladell’s Flick Album on Westbourne Methodist Church. Bournemouth Echo report on the Tesco opening. Interior, from an early postcard. 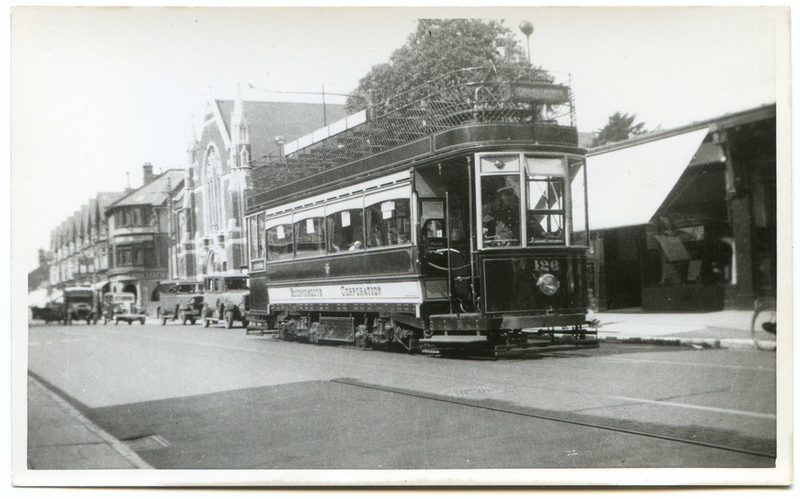 Bournemouth Tram Car 126 passing Westbourne Methodist Church in Poole Road. Period Post Card.